Travel agencies and tour guides? Yes, use them if you want to. You can usually talk your way to about 2,000 taka per person for a group of six or more for half a day. Most tour companies include riding around in a minivan, called a “micro-bus” in Dhaka, bottled water, and long talks about the sites. That said, at almost every site, actually all the time, you will be surrounded by friendly Bangladeshis eager to talk to you, about the site or not. The official guides, or random fellow who opens the site for you, appreciate a tip (10, 20 taka for the random fellow) as almost anyone likes a tip (like the guy watching your car). “Bangabandhu” – site of assassination of Sheikh Mujibur Rahman, father of the current prime minister of Bangladesh. It’s located at Road 32, Dhanmondi. Opens at 10 in the morning. There is a nominal fee and you cannot take anything (no purses, no phones, nothing), into the museum. Leave it all with a driver in the car. Agree on a time when the driver will come get you. Parliament: It’s an award winning building. If you want a tour of the inside, you will have to work your contacts. Lalbagh (there is a bath house and weaponry if you get someone to unlock the door for you): It is the site used when the TV show, the Amazing Race, came to town the first time. But, it’s so much more. Pink Palace (Ahsan Manzil): It’s a pink mansion turned museum. It has large steps which allows for a sweeping view of the riverfront. Old Dhaka/Hindu Street: Buy shell bracelets (called “shakha”). These are usually worn by married Hindu women as a symbol of their wedded state. 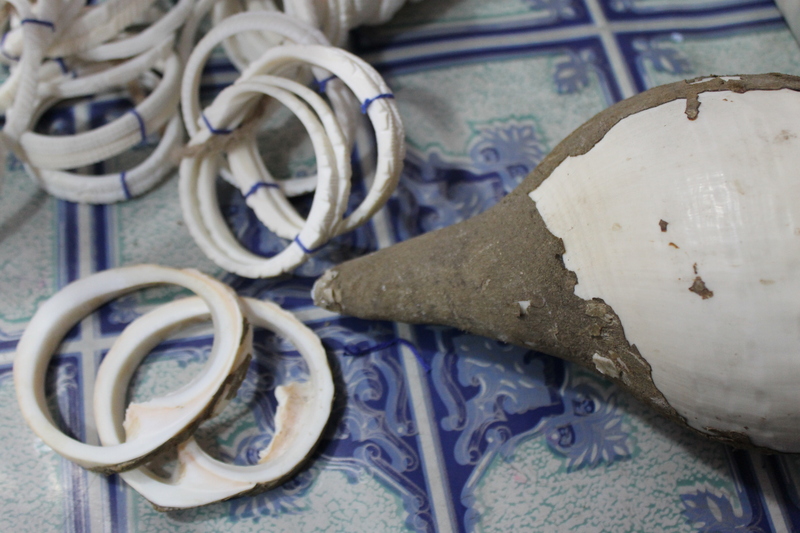 Bracelets made from conch shell. Liberation War Museum: This is not for the faint of stomach. Gruesome photos and explanations about the war in 1971. Dhaka University – Curzon Hall is a notable building. New Market: buy whatever you can find, from lace, sarees, curtains, carpets, etc. BBQ Tonite: enjoy the smoky courtyard atmosphere and grilled meat on a stick… if you have the energy. Rickshaw factory tour: Arrange through a tour company. If your guests can visit Dhaka when the Rickshaw Relay happens, even better. (The Rickshaw Relay is a fundraiser which is popular with expats.) There are half a million rickshaws in Dhaka, so you will see many of them, and I’m sure that any one of the rickshaw drivers would be happy to let you drive them around if you want to give it a try. Go to the spa. Get mehendi(henna) tattoos. It wears off after a few weeks. Shop in Gulshan: Shops include Aranya, Jatra, Aarong, Folk International, and Artisan (where “reject” Western clothes are sold, like TJ Maxx or Ross). 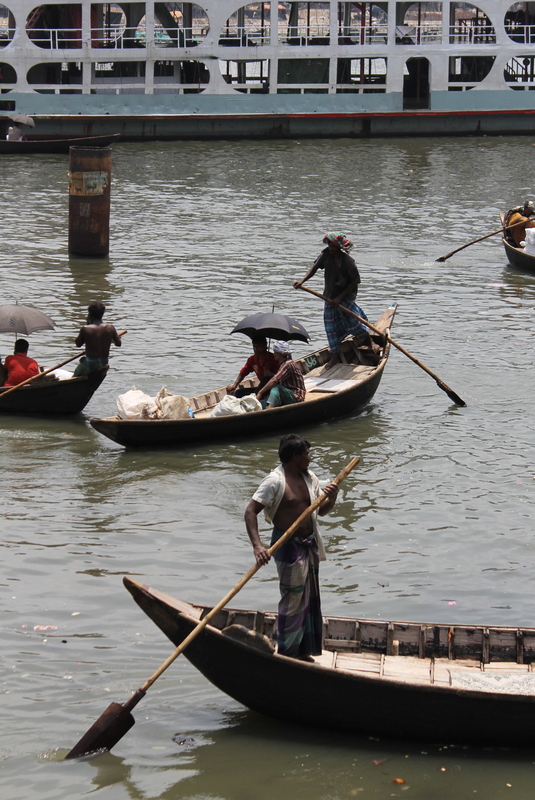 Fly to Cox’s Bazar, the world’s longest beach, or Sylhet tea country, or take a multi-day cruise in the Sundarbans, the world’s largest mangrove forest. Look for the Royal Bengal tiger. I know people who have actually seen one in the wild. Attend a wedding: If you ask your Bangladeshi friends, they are usually very happy to include your guests. Then your guests will have the fun of getting dressed in the traditional Bangladeshi clothing. Explore! Or try some of the restaurants and find more than the 100 I tried. Keep in mind that the traffic may change how much you can see in one day, or on any day. Take water, mosquito repellent, light cotton clothing, a good camera, nuts or other snacks, and sun protection (hat, umbrella, scarf). I have been on these tours in June and I sweated so much that I began to hallucinate that I was a fish. But, I got lots of photos! ← How Did the Chicken Get on the Scale? Surprised to see your comment as “AARONG sells Reject Western Cloths”. Asrong sells only own produced handicrafts, traditional Bangladeshi clothing and most importantly Aarong doesn’t sell any other Brands other than “Aarong”. Thanks for your comment, and I appreciate readers fact-checking for me, but I said that Artisan sells the reject clothing. Aarong is indeed proud of their own brand. Thanks again.